NY Mets Jose Reyes the music artist??? So Jose Reyes is expanding is talents to the studio as a budding music artist, yup that’s right the superstar shortstop of the NY Mets is starting to showcase his talents off the diamond. 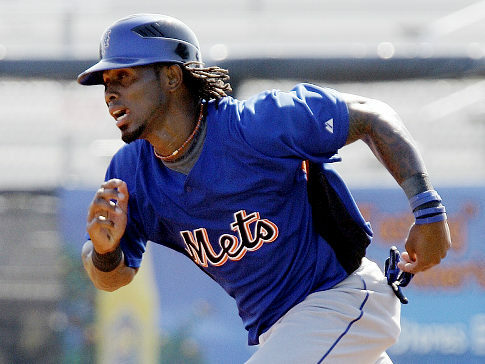 As a Mets fan we know all about the skills of Reyes on the field but to be honest Jose is a quiet person off the field. You don’t hear much from Jose outside of baseball and to be honest I always thought that was due to the language barrier, yes Reyes can speak English but you can tell he is still hesitant during interviews as he tries to make sure he says the right thing. This is a common theme with the Latino born players as they are thrust into this environment at a young age and force to deal with not only being successful at baseball but also being able to adapt to a new home. I guess you can look at music and see how Jose can crossover and still be comfortable; anyone that has watched Jose over the years understands that he is a baseball players that loves to perform and electrify a crowd. So in music he is doing the same thing, the question is can he hold a tune??? I will say this, it sounds cool!!! Since I don’t speak a lick of Spanish I can’t tell if Reyes is making any sense but I can say he looks comfortable in the video and then in the 2nd clip he is step with the beat, HAHA!!!! Oh yeah, I have no idea which voice is Reyes in the 2nd clip. I am assuming he is the 1st voice actually spitting lyrics, other than that your guess is good as mine. Can I get a translator? ?